Olympic Stain Tour & Lowes Giveaway! If you’re anything like me, the day you finally decide to stain the deck is also the day the weather man was wrong. You walk outside, gather your supplies, open up the can of stain, and…. drip drop, it starts raining. The next day it’s too hot and humid. You push the stain to the back of your mind and focus on the kids and events you have going on, until one day you finally decide that deck is getting finished. But now it’s 40 degrees outside! These situations are exactly what the OLYMPIC Paints & Stains WEATHER-READY Truck Tour will help you handle with ease. The WEATHER-READY Truck Tour will be traveling to Lowe’s stores in 21 cities across the Midwest. Along with a unique and educational home-improvement experience, the tour will allow you to be part of a Guinness World Record for the largest paintbrush mosaic! 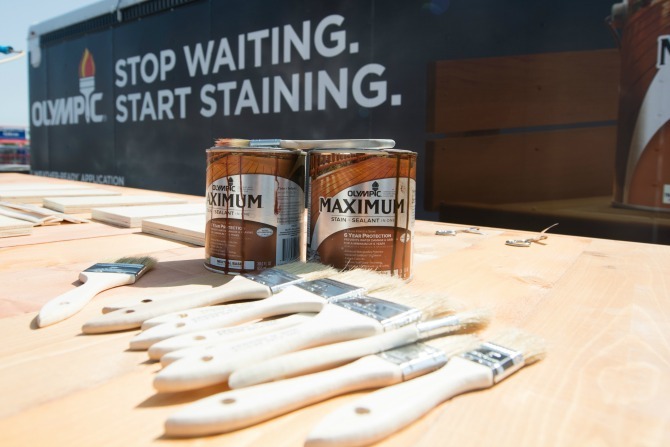 As part of the OLYMPIC Paints & Stains event, visiting DIY-ers will experience three weather scenarios, and be equipped with the knowledge to overcome each of them. In the wet environment, you’ll get to put on a rain slicker and see how OLYMPIC Maximum stain can be applied to and penetrate damp wood. Now that rainy day won’t stop your plans! Perhaps you didn’t want to work in the rain anyways. The hot environment simulation will give you a chance to see stain applied in warmer temperatures than typical stain. 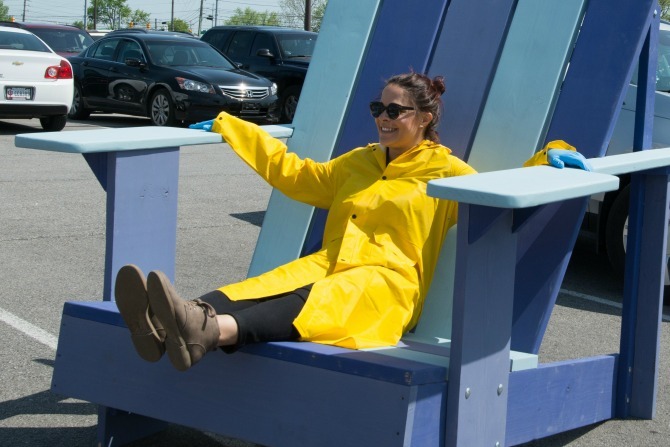 You’ll also get to use oversized adirondack chairs to view participants adding their paintbrushes from the day to the mosaic, working toward that Guinness World Record! And finally, for those cold days, an OLYMPIC brand ambassador will equip you with the knowledge you need to be able to apply stain in temperatures as low as 35 degrees. Check out the WEATHER-READY Truck Tour dates and locations below, and head over to Lowe’s to stop waiting and start saving! Friday, May 13 – LOWE’S STORE OF NW CINCINNATI, OH. I have a $100 Lowes gift card to give away! To enter to win, comment below telling me what you would like to use Olympic stain on?